Swim the Lakes launch a new company – Puffin Swim. 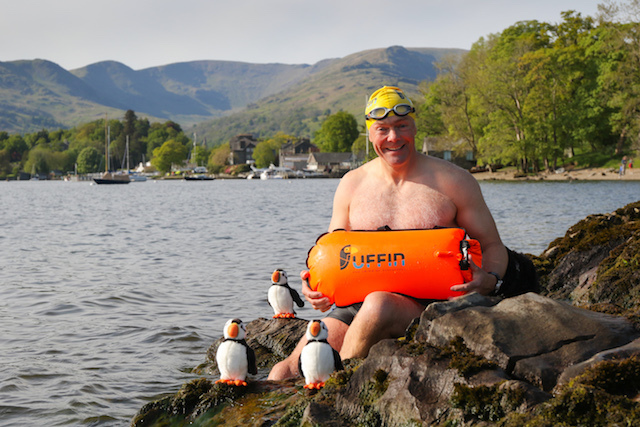 The north’s leading open water swimming experts Swim the Lakes have launched a new company – Puffin Swim, which aims to combine swim safety and adventure with sustainability. Puffin Swim is passionate about swimming outdoors and the real adventure of using swimming as a means to explore the wild environment and travel through open water. At Swim the Lakes we rely on good equipment day in, day out, for work and play. We have tried and tested all the Puffin products and will continue to source and design the best products for the greatest experiences. Puffin is driven to reduce our impact on the environment. Puffin Swim’s first product is a first for the UK a biodegradable swim tow float. The Billy Eco15 Drybag float is a bright inflatable swim tow float designed to increase the visibility of the swimmer to other water users and increase safety. The float is tough and durable and is compostable, giving swimmers a more environmentally positive choice.